Are you wondering where to go to reduce or eliminate those dark spots on your face? If you’ve had too much sun exposure then you can most likely blame that for those dark spots, known as hyperpigmentation. But here’s the thing, it’s not just external factors that cause those frustrating dark spots on your face and body. Aging, acne, pregnancy, prescription medication and hormonal imbalances are some of the other culprits. Those dark spots occur when your skin produces more melanin, which gives your skin its color. The good news for you is that there are different ways to treat hyperpigmentation including strict sun protection, topical medications like Retin-A, chemical peels, manual exfoliation, glycolic acid pads, microdermabrasion, laser treatment, a great concealer, and more. BTW, make sure you always conduct a patch test for sensitivity before applying these homemade natural remedies on your entire face. You can expect to see results within 4-6 weeks. Apply aloe vera juice or natural aloe vera gel directly to the dark spots for 30 minutes in the morning and evening. Rinse with lukewarm water and finish off with your favorite serum and moisturizer. Mix equal quantities of apple cider vinegar and water in a bowl. 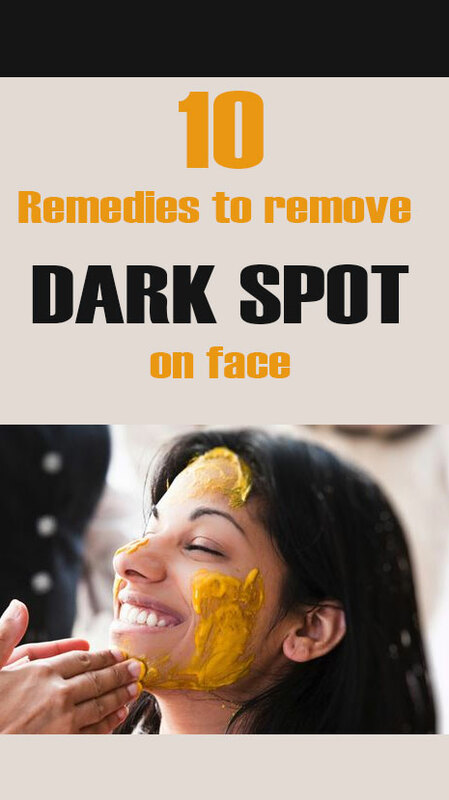 Stir well and apply on the dark spots. You can also trying mix a few drops of lemon juice with the vinegar. Another recipe is to combine 3 tablespoon of orange juice and ½ tablespoon of vinegar. Apply buttermilk to dark spots and leave on for 15-20 minutes. If you have oily skin or suffering from acne add a little lemon or lime juice. Rub a little oil with Qtip on the dark spots in the morning and in the evening. Apply horseradish paste on the skin for 15 minutes. If you want a more aggressive remedy combine one piece of grated horseradish 4-5 inches long and ½ a cup of apple cider vinegar in a glass jar. Mix well and leave for 2 weeks, shaking the mixture once a day. 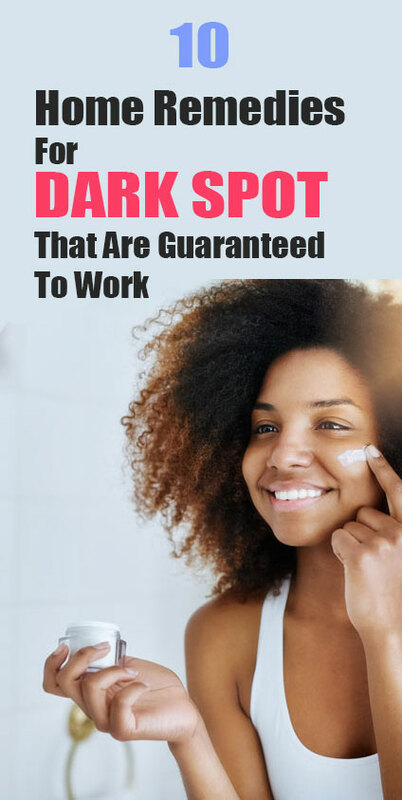 After two weeks, apply to your dark spots three times a day for one month. Place in the refrigerator. Combine 1 teaspoon of hydrogen peroxide and 1 teaspoon of milk in a glass bowl. Dip cotton pad or Q-tip in the bowl and apply to dark spots. Combine a can of mashed chickpeas and 1/3 of water. Apply paste to dark spots. Cut a slice of lemon and gently apply on the affected area for 10 minutes, morning and evening. If you have sensitive skin combine 1 tablespoon of lemon juice and 1 tablespoon of water or rose water in a glass bowl. Dip your cotton pad and apply it to the skin. You’ll see a difference in lightness within two months. Peel and remove the seeds from a green papaya. Next, use a blender or food processor until it forms into a paste. Leave on your face and neck for 20-30 minutes in the morning and before going to bed. Alternatively we also recommend Pure Fiji’s Exfoliating Scrub to refresh and brighten your delicate facial skin with the freshest of tropical ingredients. This gentle and natural scrub eases away impurities, removes dead skin cells and unblocks pores with the power of Pineapple and Papaya enzymes. Then vitamin-rich coconut crème nourishes newly revealed skin for a brighter and younger looking complexion. Can be used on acne prone skin. Combine 1 cup chopped parsley, 1/2 teaspoon baking soda, and 1 tablespoon yogurt in a glass bowl. Mix well. Apply mask to face, neck and chest for 15 minutes then rinse. Combine 1 teaspoon sandalwood powder, 1 teaspoon orange zest, and orange juice as needed. Mix ingredients together in a bowl. Add enough orange juice until you get a smooth paste. Combine 2 tablespoon rice water, 2 tablespoon flour, and 1 teaspoon turmeric in a glass bowl. Mix well. Dip Q-tip on the bowl and dab on to dark spots. It is vital that you take a conservative approach with these DIY homemade beauty remedies. Apply a small amount to your face and leave it on for a short amount of time, then work your way up to larger amounts and longer times until your skin can handle it. If you feel any discomfort, stinging, or a burning sensation rinse off the mixture immediately with lukewarm water. While you are using these natural remedies to diminish dark spots do your very best to limit your sun exposure. Remember that a good sunscreen is a must even in the winter.